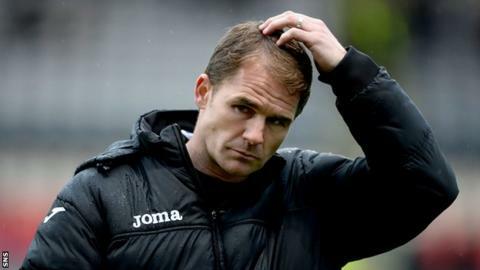 Alan Archibald feels Partick Thistle could have "nicked" maximum points in the draw with relegation play-off rivals St Mirren. Kris Doolan gave Thistle a deserved lead before Kenny McLean equalised moments before the break from the penalty spot. "I thought we edged the second half of the second half," said Archibald. "We applied pressure at the end and we hit the bar. I thought maybe just enough to go and nick it." Archibald said his side reacted well to a strong St Mirren opening at rain-lashed Firhill. The draw sees Thistle in ninth spot, a point behind the Buddies. "We knew, St Mirren, the way they had played recently were always going to start well, but after that five minutes I thought we dominated," he said. "Luckily, the rain came on tonight and made it a slick surface. There was some passing and some good movement as well but I think you can see there is nerves there, at certain decision-making, certain times of the game. "I think it's vital when you go into the bottom six that you don't lose any games, as long as you're always taking something. "That's what we've done tonight, it could have went either way. St Mirren broke on us a few times as well. A couple of deflections and by the post as well, so, no, we know that and the positive thing is we created chances as well." Regarding McLean's penalty, awarded for Kallum Higginbotham fouling Jason Naismith, Archibald said: "He's maybe just nudged him, he's maybe the wrong side of him, but I thought it was a soft penalty." Higginbotham proved a thorn in St Mirren's side throughout and Archibald was delighted with his display. "He was fantastic; there was a real hunger about him tonight, I think you can see that from the word go and it was a great ball in - I thought it was a fantastic header from Kris Doolan as well," he said. "The lads are all positive in there, it was a positive performance."